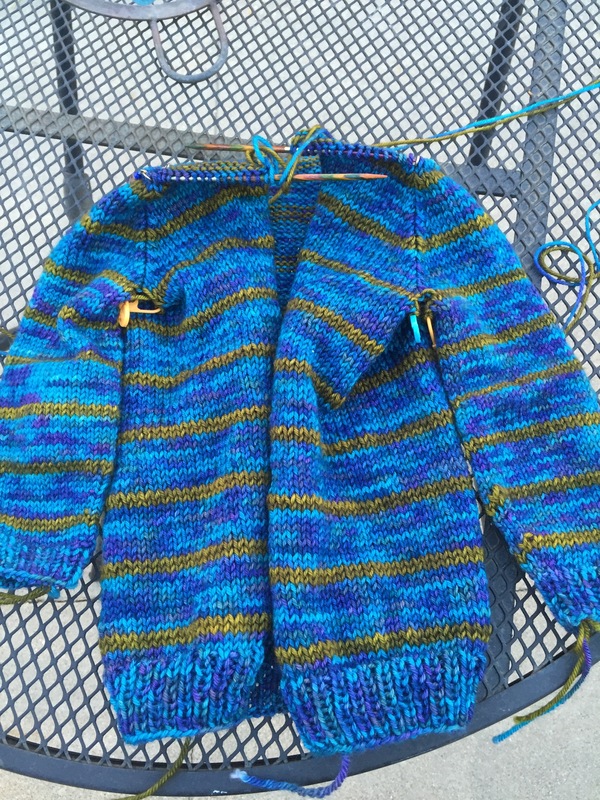 Earlier this week I gave myself the goal of finishing the sleeves on the sweater I am knitting for my nephew and getting them attached to the body of the sweater. I really don’t like knitting sleeves, so I have to set goals and power through. But, as luck (?) would have it, there was a parenting issue on Tuesday evening that led me to believe that Miss Bug needed more of our attention. Even if it was forced attention. She’s a tween, and she often lives in her own little world in her room. Which I remember clearly from being a tween/teen myself. But, that’s not always best. So, Mr. Ink pulled out a movie she’s been itching to watch, and we sat her down between us and watched a movie. Which meant that I got more knitting done than I had anticipated. Not only did I get the sleeves attached to the body of the sweater, I also managed to do quite a few rows after that. And it’s looking very nice! I’d say it’s even pretty close to being done, though I keep forgetting that there’s an entire hood to knit. But, at this point, I am allowed to put it down for awhile and work on my mystery shawl again.